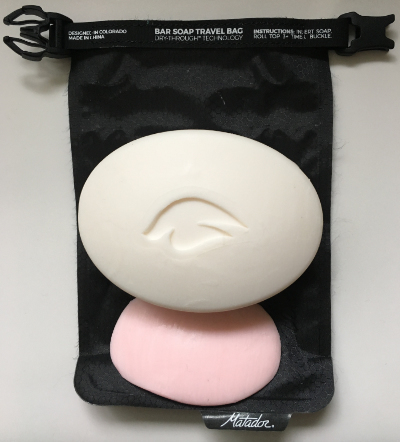 Home » All of Deb’s tales of travel and tech » Deb's Travels » Best soap dish for travel – a soap bag! Soap. I’m not about to travel without it as I travel long-term and I’m guessing you wouldn’t want to either. But any plastic covered soap dish is one of my one-bag™ travel frustrations. The goo inside as the bar melts. 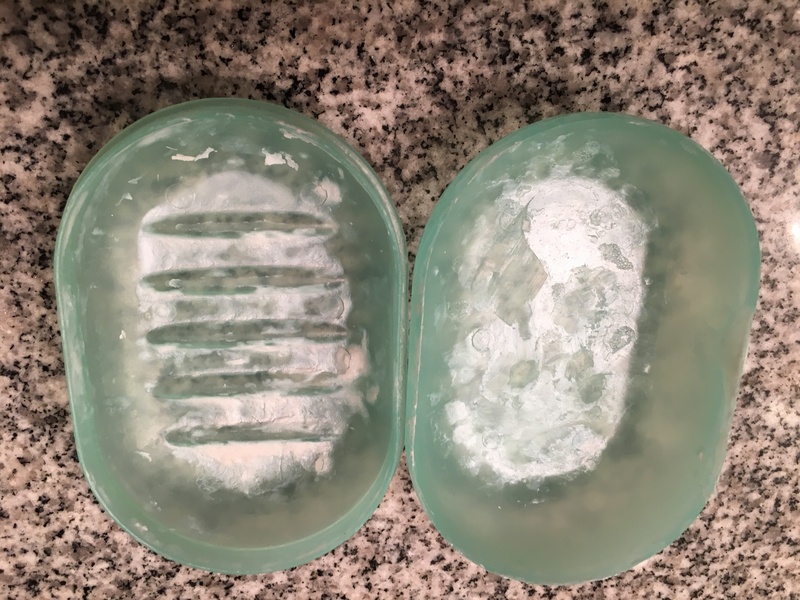 The wasted space inside the soap dish, especially as the soap wears down. 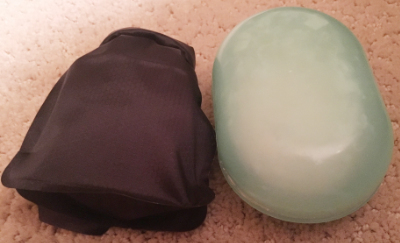 The waste of space that the soap dish takes up inside our travel bag. 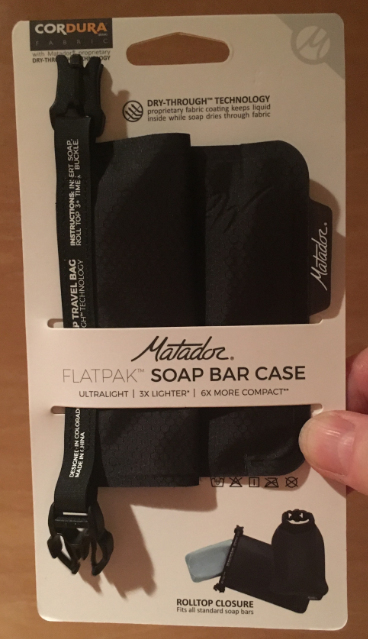 In 2018, the frustration of traveling with soap came to an end with Matador’s introduction of its FlatPak™ Soap Bar Case and its Dry-Through™ technology. I marveled at the FlatPack™ from the moment I laid my hands and eyes on it. “This,” I mimicked back to the Matador folks, “is for carrying soap?” Yes, they nodded. “And the soap won’t get gooey?” I asked. “And everything in my bag won’t get all wet and gooey,” I further pressed them. They nodded. A smile started on my face. I rolled the FlatPack™ over in my hands. This is sooo cool! I said, the words breaking through my growing smile. “I have to have one of these!” As soon as it was released, I bought mine. I was definately trying it during my next travels. My plastic soap dish and melted soap. If your soap is dry for sure, you can slip the soap dish in with your clothing but you may want to keep it in a plastic zip-lock. You may want to make sure it’s wedged tightly in a part of your suitcase where it won’t open up and get your other belongings all soapy. A rubber band or ponytail band may help, or it may slip off as with this soap dish. No need to worry about your soap’s gunk getting all over your stuff because only soap vapor, as Matador calls it, comes out of the FlatPack. You can actually put the FlatPack directly into your suitcase/backpack. However, your soap will dry better when you place the case where air can circulate around it. Clip it onto your bag as you move around if it’s still wet when you leave. For me, soap is no longer even a small frustration. 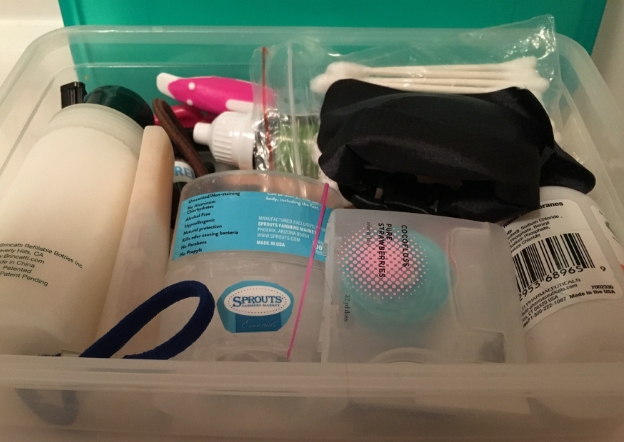 No more large plastic, so more room in my travel bag. And no more heroic measures to keep my beautiful Dove soap from melting. Not clear here: FlatPak is smaller than my plastic case. I love this soap bag but I’ll save you from a lesson I learned. 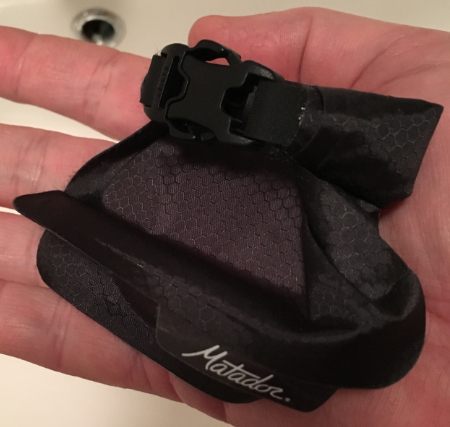 Shortly after I first started using mine, I was moving from one location to another and I also had my quick dry polyester washing cloth to deal with. I didn’t plan well so although those things dry quite quickly, it was still wet so I put the cloth in alongside my bar of soap. Maybe the one-way membrane in the soap bag would enable my washcloth to dry inside. And then, to complicate things more, I put this in my backpack rather than hanging it outside in the air. The result: Dove goo inside my bag. As you’d likely guess, the web cloth melted my Dove soap. Matador does state that we should put the soap alone into the case. However, I may try that again, with a somewhat drier cloth, hanging the soap bag outside in the air. But not with my best soap. I’m at a loss as to why some travelers carry liquid body wash. No matter where you use it, it wastes tons of plastic. But for travel, it also becomes a space and spill issue as well as a 100ml/3oz issue. It’s funny that people spend extra money on bar shampoo while carrying a liquid soap. For travel, a bar of soap is always the most convenient way to pack. Note: All photos here were taken by me.